NEAL HOWARD'S wearable art pieces are casual elegance at its best. 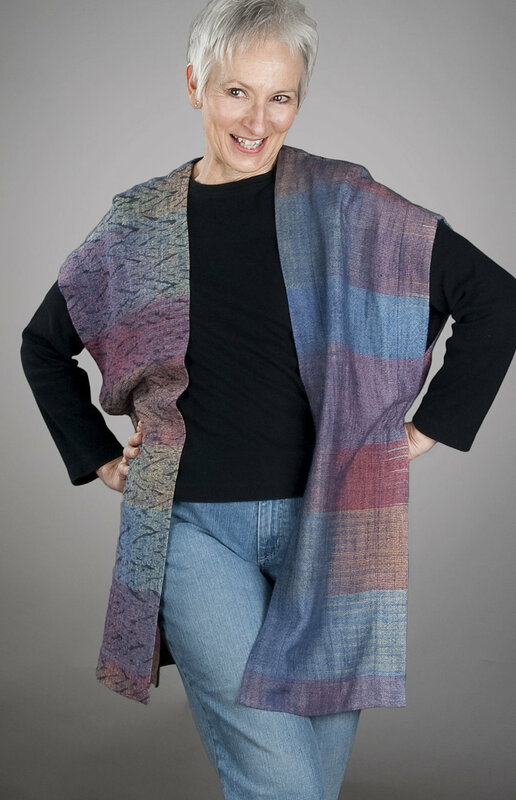 Hand woven from hand dyed silk yarns, these one-of-a-kind pieces are eye catching, lightweight, warm, and sensuously soft. Neal designs her pieces to hang gracefully on all body types, and while these pieces are perfect for casual wear, they also make for distinctive special occasion wear. Either way, wearing a NEAL HOWARD wearable art piece is sure to get you noticed! Neal's PLAZA JACKETS reflect the flexible nature of her wearable art. Whether you are dressing for the office, or dressing up for a special occasion, this can be the "go to" piece in your closet. It's loose design allows for maximum range of movement. The cut of the garment allows it to flow around the hem, which hits at hip length. This makes the design flattering to the hip area. 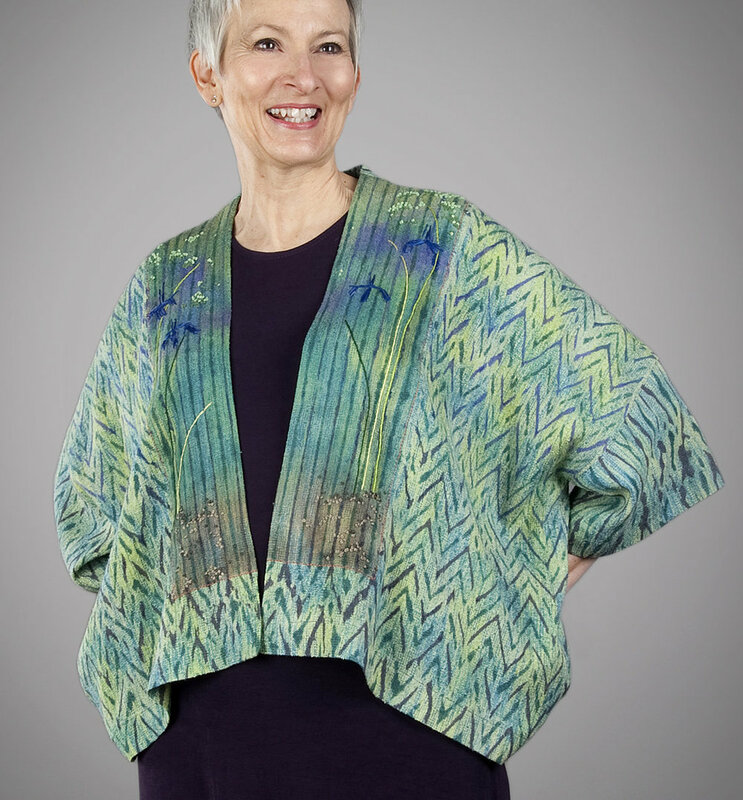 The short length of this piece draws attention to the detailed weaving and gorgeous color waves of Neal's fiber work - truly wearable art! The PLAZA JACKET shown above is an award winning garment. KEIKOITAS are a longer version of Neal's PLAZA JACKET. This elegant garment makes for perfect casual wear - it can even act as a luxurious bathrobe. 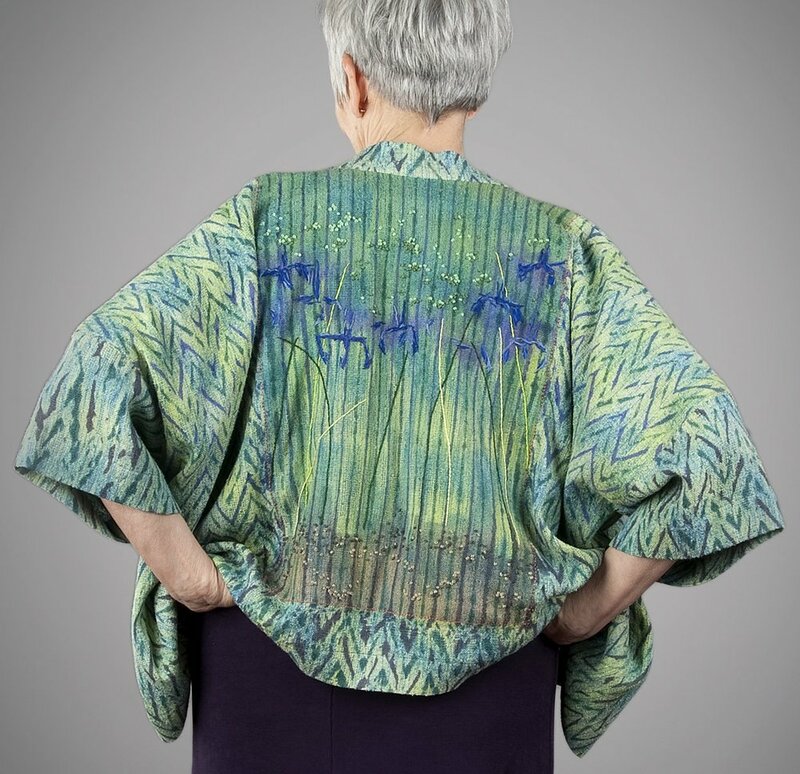 The beautiful draping of this design allows the KEIKOITA to sway with your movements, and the front panels dance along the hemline as you walk. This draws attention to the luscious color and rich texture of the handwoven silk when you move - making it the ideal stand out piece for important events. When you want to feel special and cherished, the KEIKOITA is the perfect piece of wearable art with which to adorn yourself! TABARDS are the most casual of Neal's clothing designs. This smartly styled vest has an underarm flange that allows it to fold flat, making it easy to pack. Neal's handwoven silk is lightweight and warm, adding to its travel happy qualities. TABARDS are particulary well suited to active individuals, and the strong vertical lines of the design allow it to cover a multitude of sins in the hip area. 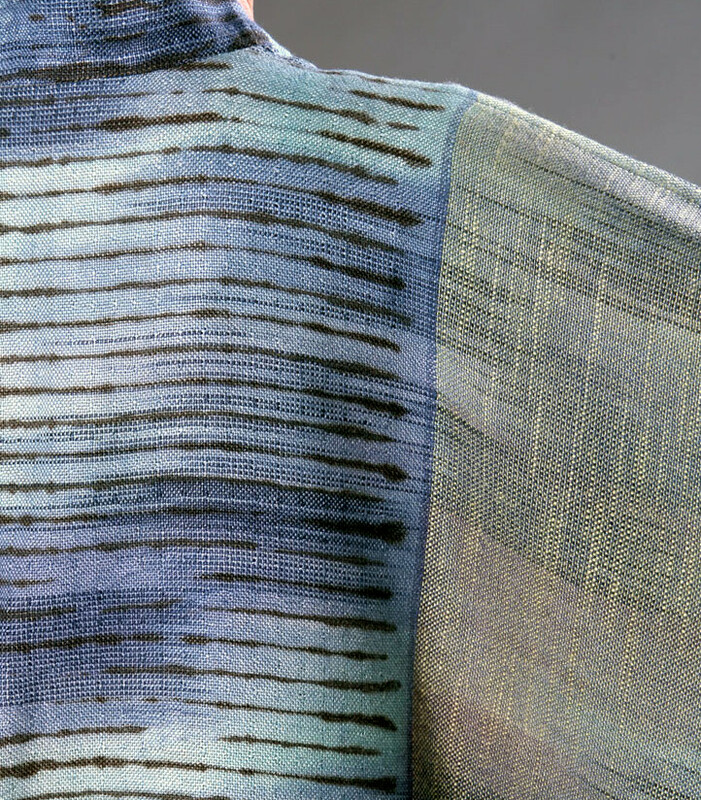 With its long panels, it is also an excellent showcase for the striking visuals of Neal's dyeing and weaving. NEAL HOWARD has been collaborating with master weaver and clothing designer LIZ SPEAR for more than 17 years. Liz, who sews Neal's garments, spent several years collecting the remnants of Neal's handwoven fabrics. With a large stack of Neal's gorgeous scraps acting as inspiration, Liz started incorporating them into her one-of-a-kind jackets. These striking collaborations can be seen at the events Neal and Liz attend - they show their works as partners at art shows and fiber events. WEARABLE ART CLOTHING LIKE THE PIECES FEATURED ON THIS PAGE, ARE BEST PURCHASED IN PERSON.